Cozy Retreat on Bay of Fundy w/Artist Studio~Pet-Friendly~Fire Pit~Balcony~Deck. Lubec Bay Cottage is a picture-perfect 1920's Maine seaside cottage with wonderful character and all the comforts of home. Imagine having fabulous bay views from every room and being surrounded by 3 oceanfront acres of bird-friendly organic gardens and lush wildflower meadows in a peaceful, rural setting. Stroll down our Boardwalk to our private shoreside sitting area with fire pit/grill, which is adjacent to the renowned Sand Bar birding marshes. This enchanting cottage is situated in a breathtaking setting with spectacular sunrises and is beautifully furnished with fine antiques and coastal decor; a picture-book Downeast cottage that has kept its original character and charm, while having all the comforts to make you feel at home. Our expansive 400 square foot outdoor living area is a wonderful space for grilling, dining, and taking in the views on our cozy swing. With a balcony just off the master bedroom, you have a bird's eye, 180-degree view of the ocean and can see the Spark Plug lighthouse and Campobello, Canada! Close enough for walking to South Lubec beach, our Cottage is less than 2 miles from West Quoddy Head State Park with Lighthouse and 4 miles from town and Campobello Island with its Roosevelt Park and East Quoddy Lighthouse. Because our cottage is a Maine DEP-certified Environmental Leader implementing environmentally-friendly practices, you will feel safe during your stay. You can freely enjoy our gardens, lawn areas and meadow because they are organically maintained, and you won't have to worry about harsh chemicals because housekeeping only uses GREEN cleaning products. Along with having an extraordinary cottage with beautiful surroundings we provide special touches that you will only find at Lubec Bay Cottage! Our cottage doesn't feel like a vacation rental - you will feel at home, like family. We are very pet-friendly! Your pets will love it here. On the property, we have a lovely meadow and lawn area; are adjacent to the sand bar marshes; and are close to the expansive South Lubec beaches. We also supply pet food bowls. Not far away are numerous hiking trails for you and your pet to explore. Lubec Bay Cottage is a special place you'll look forward to returning to after a day of adventure! Lubec Bay Cottage is wonderful for honeymooners or for those celebrating an anniversary, birthday, or searching for a romantic getaway. In the morning, awake to a beautiful sunrise over the bay and sip your morning coffee or tea while relaxing on the balcony. While enjoying your lunch on the deck, watch the bald eagles flying over the bay. In the evenings, enjoy a fire at the shoreside fire pit; listen to the relaxing sounds of a fog horn; enjoy a romantic slow dance to your favorite song under the brilliant night sky. For indoor leisure time, play a game on the small-scale vintage tabletop pool table or choose one of the several popular board games; warm up to the electric fireplace while watching a movie chosen from our DVD library; read from our library of sea-themed and Maine-authored books. All this without leaving the property! You don't have to be an artist to enjoy Lubec Bay Cottage! But if you would like to bring your paints, brushes, and canvases for painting while on vacation there is a working studio for your use on the property. The situation is intended to complement the comfortable surroundings with an atmosphere of creativity. The Studio is an early 1900's rustic workshop that has been converted into a working studio with plenty of natural light, several work benches, a French easel with daylight lamp, drying rack, space station and cart, pack stool, designer's drafting table with ergonomic adjustable chair, and print rack. The picturesqueness and natural beauty of Lubec is truly inspiring and you will enjoy the luxury of having your own working studio. We only ask that the equipment not be used for children's play. Lubec Bay Cottage looks out onto the South Lubec Sand Flats, debatably one of the top ten places to bird in Maine. Migratory shorebird abundance and diversity is among the highest along the eastern U.S. coast. Whether you observe from the deck, the balcony or the shoreside observation area, you won't be disappointed. You may also access the Sand Flats from the property. A number of shorebirds have been spotted including the Short-billed Dowitcher, Black-bellied Plover, White-rumped Sandpiper, Bairds, Least Sandpiper, Dunlin, Semipalmated Plover, and Lesser Yellowlegs. The cottage is a short drive to other Downeast birding locations including Quoddy Head State Park overlooking the Grand Manan Channel, Carrying Place Cove Bog, Boot Head Preserve (notorious for its Spruce Grouse), and Campobello Island. For your use, we keep a copy of an excellent Maine birding resource, 'Maine Birding Trail' in our library. Lubec Bay Cottage is extremely comfortable and so peaceful. It encourages inspiration in abundance. This classic, cozy cottage with its surroundings stimulates creativity, feeds your imagination and allows you to concentrate without distraction. It is a wonderful writer's retreat. Lubec isn't another Bar Harbor or Acadia National Park - it offers all the beauty and adventure of those areas, but without the crowds! Taking care of my Lubec cottage and guests and spending time in my gardens are my passions. 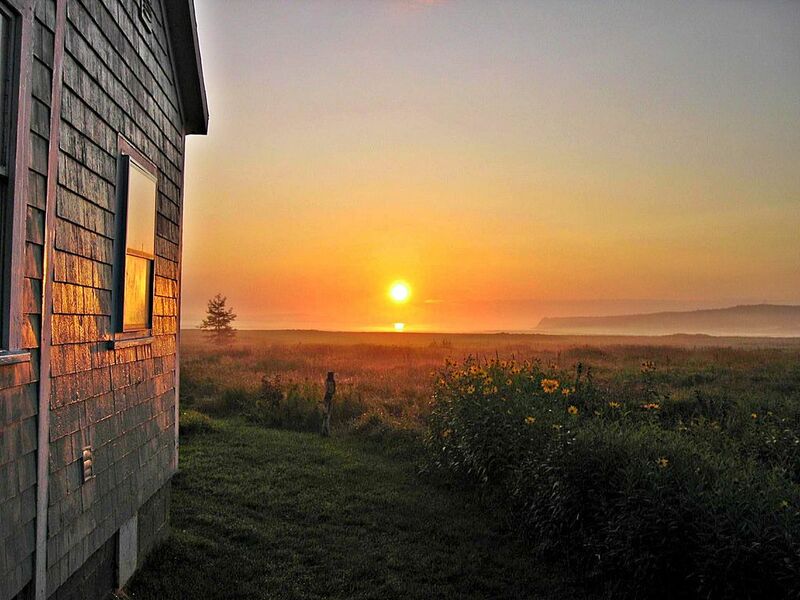 Many of my guests return year after year because they miss Lubec, love the cottage, and trust that their time here will be as wonderful as it was during their previous stay. If you are considering a Lubec vacation, I'm certain that you would enjoy a stay at Lubec Bay Cottage. Lubec reminds me of coastal Maine when I was a child - simple and carefree with beautiful scenery, plenty of things to explore, mouthwatering seafood, and friendly people. I have always had a picture in my mind of what my perfect Maine seaside cottage would look like - Lubec Bay Cottage is my dream that has become a reality. I provide many special touches in hopes that you will feel right at home and have what you need to make your vacation wonderful. I want to make sure it's right for you. If you are celebrating an anniversary, birthday, or holiday during your stay please let me help with planning your special occasion! I look forward to hearing from you! toilet, shower, on first floor with ocean view. toilet, combination tub/shower, on second floor with ocean view. The convenient first floor 3/4 bathroom has a glass shower enclosure and is adjacent to our utility area with dressing table, washer and dryer. The spacious second floor full bathroom has a large tub with shower and hand shower, and is adjacent to both bedrooms. The towels are plentiful and very soft for your comfort. Housekeeping uses environmentally-friendly Green cleaning and laundry products. Spectacular views of the bay. Wildlife abounds. Three oceanside acres with direct access to the Sand Bar birding area. Relaxing shoreside sitting area with fire pit/grill. During high tide can launch your kayak from property. Free local and International (U.S.A. & Canada) long distance calling. Electric fireplaces in living room and upstairs reading room. Plenty of soft towels provided. Green cleaning products used. Seating for 6 with electric fireplace and widescreen DVD player with DVD library. Full-size refrigerator with freezer. Ice packs. Cubed ice. Antique gas stove with full oven and broiler. Programmable coffee maker with glass and stainless carafes. Also a French Press and Burr coffee grinder for the best coffee ever! Plenty of dishes, glasses, serving trays, flatware, bowls, baking pans, storage containers. Equipped with hand and stand mixers, waffle maker, food processor, blender, baking utensils, T-Fal cookware, sharp Chef knives. Separate dining area with views of the ocean. We have a library of 50+ DVD's for your enjoyment to use with flat screen TV. Beautiful organic lawn and garden areas with fragrant sea roses and other flowering trees, shrubs and perennials. A comfortable sectional sofa and bistro seating. Storage area for the light rain jackets and mud boots that are supplied for your use during your stay. Expansive deck with dining area, swing, and gas infrared grill. There are 4 Adirondack chairs with fire pit/grill at the shoreside sitting area. We have a fully equipped artist studio with daybed. The balcony has bistro seating for two and a wonderful 4-person sectional sofa. The deck provides a dining area with umbrella for up to 6 people, a swing, a Bio-ethanol-burning fireplace with seating, 2 lounge chairs and an infrared gas grill. Every room has ocean views!! This is a GREEN-Certified Maine Environmental Leader Lodging and a No-Smoking property. Coastal Maine at it's best! We made our choice to stay at Lubec Bay Cottage back in April, and were not disappointed in the least when we finally arrived and spent our 8 nights this October. The only downside I could see was that the weather was a little too cool to spend enjoying the nice deck and balcony and fire pit like we had envisioned. The cottage is wonderful, rustic, peaceful and cozy! We were so comfortable and felt welcome. The Lubec (and Eastport) areas were great to explore and the locals (and tourists) were friendly. There are so many State Parks, wildlife preserves, forests and shorelines that you wouldn't see (or do them) all in 10 years. And fresh seafood is readily available (and cheaply obtained to cook yourself), with reasonably priced restaurants around. We will be coming back again ! Hi Phil and Debbie, Yes, the area is full of places to hike, photograph, and explore, and my cottage is a wonderful home base to return to after a day of adventure in Lubec, Eastport, or Canada. The people are so friendly here and the seafood is spectacular! I thoroughly enjoyed being your host and look forward to your return in September! Take care, Catherine. Lubec Bay cottage is perfect both inside and out! Catherine has decorated her place beautifully and comfortably in a way designed to make her guests feel relaxed and at home. Upon arrival, we discovered a wonderful gift bag filled with local fresh produce and local goodies...so very thoughtful and welcoming. We awoke every morning to a spectacular sunrise view over the ocean---it was indescribably peaceful, beautiful and private. We enjoyed breathtaking trails at Quoddy State Park, whale watching and visiting Campobello Island. We ended each day gazing at phenomenal star filled skies from the spacious deck of Catherine's cottage after stuffing ourselves on delicious home cooked fresh lobster. Lubec is a beautiful unspoiled destination that offers the perfect balance between activity and peaceful relaxation and Catherine's cottage is a perfect sanctuary in this magical town. We were very sad to leave and can't wait to come back to Lubec Bay Cottage! Hi Maria, Your statement: "A perfect sanctuary in this magical town." says it all! I so enjoyed being your host and look forward to your return! Sincerely, Catherine. Things we noticed: acrobatic shearwaters on the Bay of Fundy, kittiwakes at the Salt Pond, eagles hunting, skittish sandpipers stumbling on irish sea moss, clam diggers filling buckets at low tide. Osprey nests overlooking Cutler Bay. Periwinkle snails on the beach path. Massive spider webs. Wildflowers and Catherine’s lovely garden. The buzzing of bees. An absence of airplanes and traffic. Wind in the sea grass. Bear tracks. Stars. Subtle whale songs off the coast of West Quoddy. Humpback whales dipping under our boat near East Quoddy. Fin whales, minke whales, seals, and a glimpse of an eagle’s nest in Passamaquoddy Bay. The scent of balsam, spruce. An arctic bog. Wilderness. Hiking. Sea air. The diesel chugging of a lone lobster boat at 5 in the morning as the sun rose over Campobello Island. The down to earth townsfolk, and, what I call the Maine Wave - a rising of the hand, a hello, a friendly acknowledgement. For entertainment skip the TV and play Scrabble, read the guest comments left for Catherine, hit Summer Keys, The Lubec Grange, and Shanna Wheelock's Crow Town Gallery on South Lubec Rd. for concerts. At Crow Town, the ceiling is made of the same wood as violins giving a superb acoustical experience. The backdrop of the stage at Crow Town is Lubec Bay, and her melancholy sculptures - what she calls Column Vessels - pottery imprinted with the detritus of abandoned sardine factories - stand as witnesses. We utilized the well-equipped kitchen to cook our meals and also went to Frank’s Wharfside, Water Street Tavern, and Cohill’s for food. The produce Catherine left was an over the top kindness and much appreciated. We immediately made mint-watermelon water to sip on the porch. I brought home the handmade soap, honey, and maple syrup knowing I would miss this place the minute I stepped foot in the door. Lasty, and certainly not least, read the book Downeast Maine / A World Apart in the nook upstairs. Lubec, Maine is truly a world apart, and reading it will give you new eyes to appreciate the dance between the people and environment here. I have traveled widely abroad and at home, and there were three times I awoke the morning after returning from traveling and felt out of sorts: Guatemala, Africa, and Lubec, Maine. This is a very special place, and Catherine has done an exquisite job of anticipating the needs of her guests at every turn. More than highly recommend, I urge you to visit. Don’t waste another minute deciding. Fabulous view in a charming cottage with an AMAZING owner! My husband and I and brother all agree with the very positive reviews written by others. Nothing was overstated. It's all true, and we loved every minute of our stay. Catherine thought of absolutely everything that guests would enjoy - a lovely gift basket on the kitchen table and a refrigerator of locally grown greens and veggies overwhelmed us, and we used everything. Particularly memorable was waking up to the morning sun across the marsh and gazing at the stars from our bedroom balcony. We found tons of things to do in the area - from visiting the small sardine museum in Lubec and attending a delightful Wednesday night Summer Keys concert at the Congregational Church to walking trails at Quoddy Head, in the woods down near Cutler, viewing the Bay of Fundy tidal effect at Reversing Falls Park up in west Pembrook and Cobscook Bay State Park. In addition we spent a great afternoon in Eastport, visiting the town, Shackford Head State Park and stopping in a small Barracks Museum museum and finding the remains of Fort Sullivan. Monica's Chocolates and the tour at Raye's Mustard were fun stops also. And, of course, Roosevelt's estate at Campobello was great - went there two days. We would highly recommend this well-situated and well-appointed cottage! Hi Carol, I so enjoyed hosting you and your family and thank you for the wonderful review! My guests' reviews are what make renting my cottage all worth while. There is so much to do in the Lubec area having Eastport across the bay and Campobello Island, Canada across the bridge! There's never enough time to do it all -- that's why my repeat guests now stay up to 3 weeks at a time! I hope I get the chance to host you again! Best wishes, Catherine. This summer was our 10th at Lubec Bay Cottage—a testimonial to the beautiful, comfortable, welcoming home that Catherine has created. We had another wonderful week of morning walks to South Lubec Beach and Quoddy Head and afternoons spent in favorite places on Campobello Island. We love returning year after year to the view of the meadow and water (visible from almost every spot in the house, including the shower! ), a house that feels like home, and a perfect location that gives us easy access to all that we love about Lubec. Hi Mark and Cindy, What a wonderful review - thank you so much! You have summed it up so perfectly about the feeling you get from staying at my cottage and spending time in Lubec. Thank you for your continued support and for your friendship. Sincerely, Catherine. What a fabulous stay at a lovely cottage! And the setting is extraordinary too! Lubec Bay Cottage was our home for a week as three of us rambled about Downeast Maine and a bit of New Brunswick. Catherine has developed a wonderful property -- exceedingly well-equipped, immaculate, nicely decorated and perfectly situated between the village of Lubec and West Quoddy State Park. The two decks -- one upstairs off master bedroom, an expansive one off the kitchen-dining area -- were where we spent much of our time at home. Admiring water and meadow views while grilling, dining, reading, having a glass of wine...a perfect set-up for having friends over or a quiet moment enjoying the 4:15 am sunrise! The living room was comfortable too. And both bedrooms (three beds total, all upstairs) had comfy linens. Very thoughtful, welcoming touches throughout. Great to have a bathroom on each floor, with showers in both (plus tub upstairs). Highlights of our trip were: the puffin trip from Cutler to Machias Seal Island (wow! ); "Tea with Eleanor" at the Roosevelts' summer home on Campobello Island (bring passports); lighthouses (West Quoddy, Head Harbour, Little River, "the Sparkplug", etc. ); hiking and birding everywhere; exploring Machias, Beals Island, Moosehorn National Wildlife Refuge, St. Andrew's; meals at the house, in Lubec (Water Street Tavern, brewpub, seafood stands), Machias (Helen's), and Beals Island (seafood shack). Sorry to miss the Fourth of July celebration in Eastport, but maybe next year. Canada Day on July 1 is easy to celebrate too! We had every kind of Maine weather except snow, and loved the people, places, cultural and natural history, and proximity to Canada. Spectacular vacation, with LBC and Catherine's hospitality as the centerpiece. Thank you -- we look forward to returning! Lubec Bay Cottage is a wonderful place for relaxing after a day of activities. There are so many things to do: Bird at Hamilton Cove or take a Puffin Tour to Machias Seal Island Bold Coast Charter Co. in Cutler. Hike the trails of West Quoddy Head State Park and take along a picnic lunch. Comb South Lubec Beach for treasures; ride a water-taxi to Eastport; Geocach to over 221 caches in Lubec and the surrounding areas. Take a Plein Air Workshop with Michael Chesley Johnson, or rent a kayak or bike or take a whalewatching tour at Lubec's Inn at the Wharf. During migrations, site whales off West Quoddy, just down the road, or off East Quoddy on Campobello Island, Canada, just 4 miles away. Just remember to bring your passport. See seals feeding in Lubec Channel or in the bay behind the cottage. Meet local artists in their galleries or learn the local history at the Lubec Historical Society, McCurdy's Smokehouse and Roosevelt International Park. You must try 'Tea with Eleanor' at the Roosevelt Campobello Park or a round of golf at Campobello's scenic Herring Cove Provincial Park Golf Course. There are also Summerkeys music concerts downtown during the summer months, two chocolatier shops, a wharf for purchasing local seafood, and a great variety of restaurants for eat-in or take out. Please Like and Share Lubec Bay Cottage on Facebook! Save on your nightly rate by staying a week or more! Inquire for Holiday rates. Check-in anytime after 4:00 pm; Check-out by 10:00 am. Maximum of two small to medium-sized well-behaved dogs - $15 per Pet per Night. Prior approval is required for pets. No Cats please. Lubec Bay Cottage cares: We are a Maine DEP-Certified Environmental Leader cottage implementing GREEN environmentally-friendly practices inside the cottage and outside in our green spaces. This is a Smoke-Free property. Lubec Bay Cottage is in a residential area so there may be occasional sounds from mowers, weed whackers, and the like. Mowing of our lawn may occur during your stay - thank you for your cooperation. During our 'Shoulder months' - April, late October and November - some of the stores, restaurants, and tours in Lubec and its neighboring towns/cities are closed for the winter season. Some consider Lubec a seasonal vacation area; for others who love its natural beauty and enjoy the small town experience - it is a year-round area. It all depends on your wants and needs.